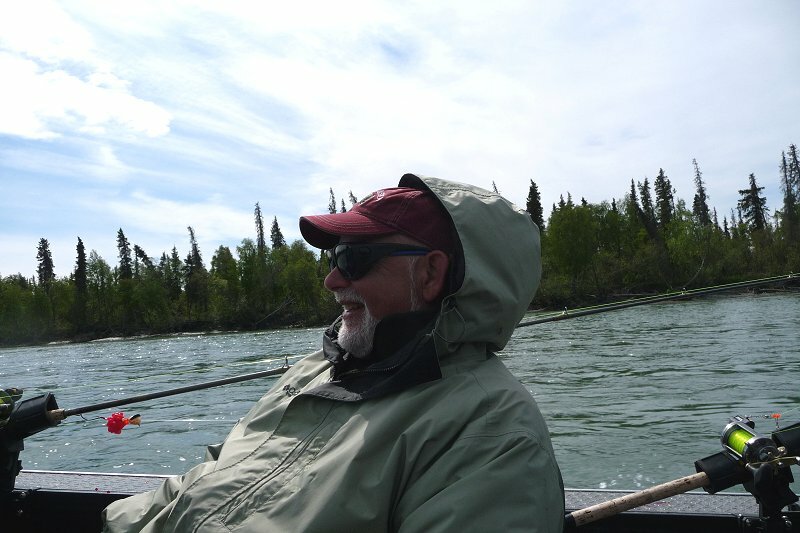 For our last day at TRL we were teamed up with Bob from New Hampshire for a day on the Kenai River with guide Rich. Sun and blue sky emerged from behind the cloud early in the morning and the conversation — even the bantering between myself, my brother and dad, with Bob and Rich chiming in as well — was good. Rich quickly began our earnest search for the mighty king. High tide wouldn’t bring fresh fish into the river until two o’clock, so we searched for any fish holding from the previous day. We drifted then ran upriver or to a new spot. Then we did it again. And again. Rich offering advice to dad on his first fish of the day. Then, sometime during the mid morning and after we had been lulled into inattention, dad’s rod tip quivered. Rich shouted, “Jerry, set it.” Dad pulled the rod out of the holder. At the same time, the rest of us began to reel in line to avoid tangling. Rich positioned the boat to keep the fish from running to far. Soon enough, probably no more than ten minutes, we had a smallish, eight to ten pound king alongside the boat. The decision to keep or release was given over to dad. (Regulations allow keeping one king a day…once you do, you’re done fishing for the day.) The decision was to release the fish. Thanks to this king, I think optimism was fanned in each of us. After lunch we began to experience what is called “the cheeseburger drop.” Hearty cheeseburgers and homemade chips tend to bring on an urge to sleep, and a warm sun didn’t help. Mark’s head began to bob. Dad’s a bit more practiced at napping in a sitting position, but his eyelids gave him away. I couldn’t see Bob, but I am sure he struggled as I did to keep attention on his rod tip. With no indication that fresh kings had pushed up with the incoming tide, Rich told us to reel ‘em up as we were heading upstream. We passed the TRL docks and passed around a sweeping bend, then settle in a bit further upriver. Told to “drop ‘em,” we were fishing again. After an initial drift through this run, we motored back up to the top. We had about two hours left to fish. About a third of the way through the run, Rich was on his cell phone and all was quiet. I stared at my rod tip, in disbelief, as it began to bounce towards the stern. “Um, Rich?” I asked. “Strike it!” was the answer. I yanked the rod out of the holder and drew back the rod. The tip plunged toward the river. I reeled for all I was worth through the line seemed to be slack, wondering it whatever was on the end of my line might be running toward our Willie boat. Sure enough, in a flash of silver the fish turned and began to head around the bow. Rich motored the boat forward to keep up with the king, then drifted as the fish turned downstream. Taking me all the way around the boat, the fish began to tire as I stood at the stern. Three times we tried to get the fish to the net and three times it veered away from the boat. But with Rich’s expert instruction I was able to lead it forward, raise my pole over Rich’s head, then pull down to lift the fish’s head, allowing Rich to get it into the net. 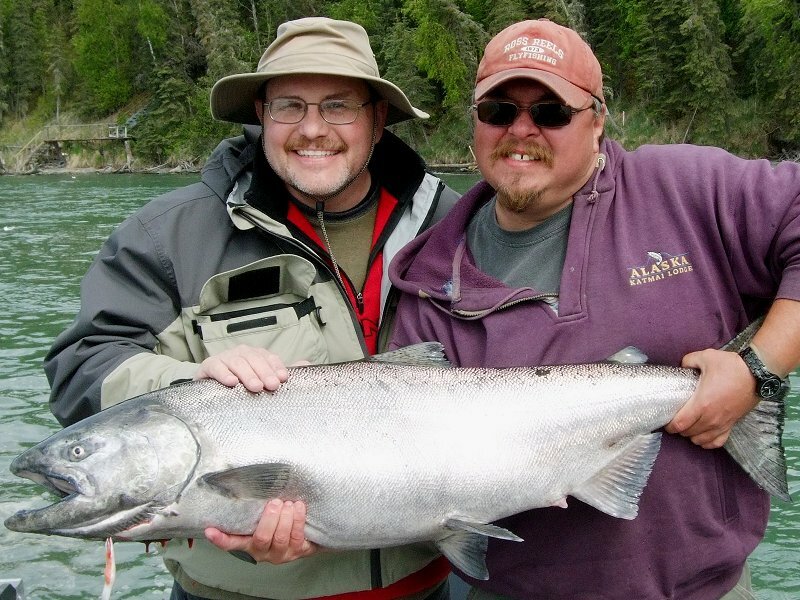 My first Kenai king, which ended up measuring 44 inches and about 38 pounds! What a way to end the trip. 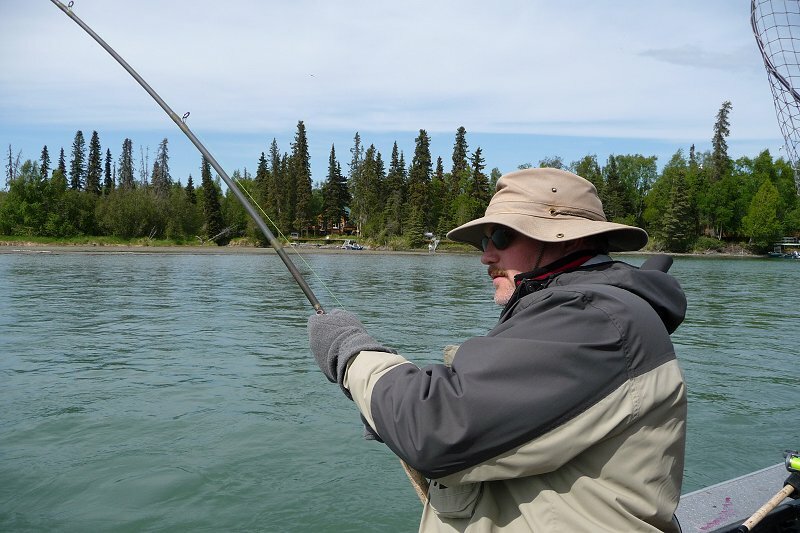 Since the regulations dictate taking only one king a day from the Kenai, I was done fishing for the day. Me, my fish, and Rich. After settling down and getting my king into the box, we ran up to the top of the run for another drive. We had 90 minutes left to fish. We had drifted a short distance when dad’s pole tip began to dance. Again Rich called for a strike. Dad lifted the pole out of the hold and heaved back. The pole almost doubled over. Then the line went slack. Bob, Rich and I told dad to keep reeling, knowing that kings often head towards the boat, giving the illusion that there’s nothing on the line. Sure enough, dad’s line began moving away from the boat and in no time was 150 feet out. The king headed to the rear of the boat and rolled, showing a rosy side and giving us a glimpse of its huge size. This tug of war would play out for almost twenty minutes, with much excitement. I prayed that this fish could be landed as it would be a great way to cap off a “trip of a lifetime” for dad. Again Rich coached the fish into the net and we all were amazed at its size. Fifty inches and an estimated fifty-five to sixty pounds. That king is still in the river…unfortunately it fit nearly smack dab in the middle of the slot limit (forty-six to fifty-five inches). Near as we could determine, it was the biggest fish caught the week of our stay at TRL. That would be the last fish we hooked this trip. Exhausted and exhilarated we headed back to the lodge for a celebratory beer with Bob and Rich, followed by a nice seafood dinner. A surprise cake for Bob’s anniversary and champagne ended up as our dessert. Good weather, amazing scenery, big fish. What an amazing trip! Dad warding off the chill of a June Alaska morning. Dad ready for day; it’s been a busy trip. Mark taking a photo of me taking a photo. 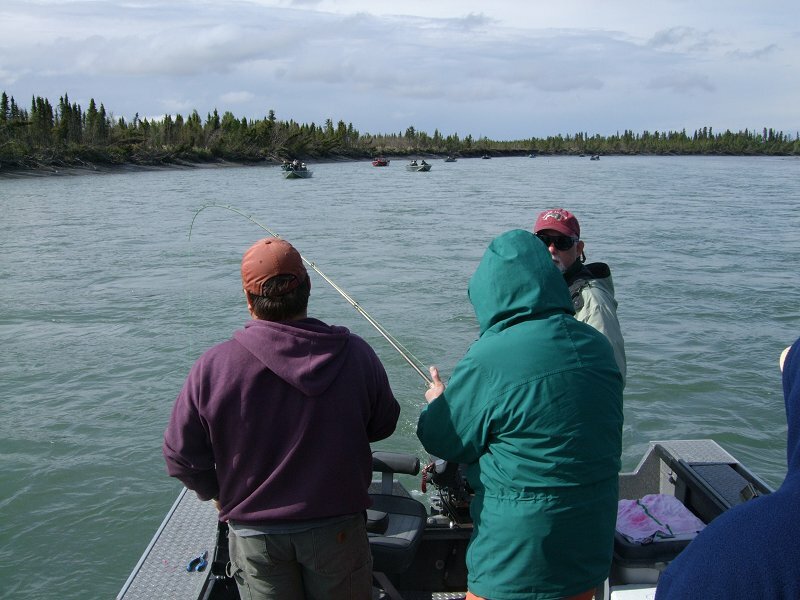 Floating down stream on the lower Kenai. Dad’s first Kenai King putting on a show. Making a decision to release in hopes of a bigger fish. Dad’s first king, deemed to be about 10 lbs. Mark tucked in for the upstream run. Following the fish to the stern. …and following that fish around to the other side of the boat. There’s a fish out there. Cranking down on that bad boy. That’d be 43 inches and about 38 lbs! Dad fighting a monster fish. Almost can see dad’s fish. Thinking about the slot limit. And, believe it or not, too big. Cleaning out the roe for use later. All of us would share in this one. 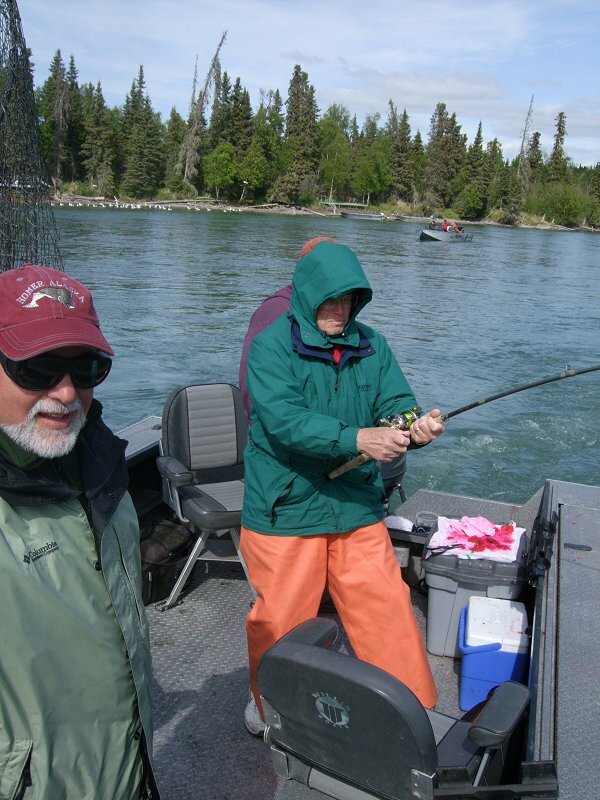 Categories: Alaska, Fly Fishing | Permalink.